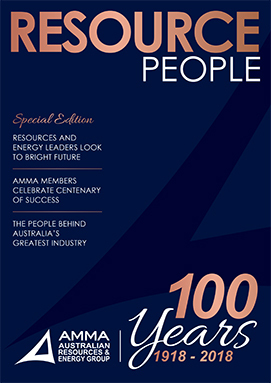 AMMA’s highly regarded quarterly magazine Resource People keeps our members abreast of the latest developments across policy, human resources, diversity, training and development, innovation and workplace well-being. Resource People is a magazine that focuses on the human side of Australian resources – from the boardrooms of the largest mining corporations to the most remote worksites in the country. It’s the people within the Australian resource industry that are constantly innovating, tackling new challenges front-on and evolving the industry to the point in which it will lead the nation’s economic strength for decades to come. Covering topics including recruitment, innovation, migration, training, finance, diversity and OHS & wellbeing; these are the stories that transcend state borders, sector barriers and age and cultural demographics. Resource People is distributed in hard cover to more than 5,000 professionals and executives within the wider Australian resource industry.